John Key's National Government looks set to mount the most determined attack on welfare payrolls since the current system was created in 1938 after a far-reaching review made public yesterday. A welfare working group led by economist Paula Rebstock recommends forcing almost three-quarters of sole-parent, sickness and invalid beneficiaries, including all sole parents with no children under 3, to look for at least part-time work. It would make sole parents who have another baby while on the benefit look for work when their babies reach 14 weeks, and would make long-lasting contraception free for all women on benefits. 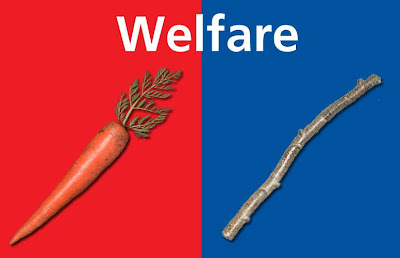 All existing welfare categories would be rolled into a single benefit called Jobseeker Support, paid at the rate of the dole, with supplements for sick and disabled beneficiaries and sole parents. The welfare system would be transferred to a new Crown entity with a business-oriented board. In the longer term, both welfare payments and support could be contracted out to consortiums of iwi, voluntary and private organisations. The group says its dramatic reforms could slash the number of working-aged beneficiaries by 100,000 by 2021 and cut net costs by $1.3 billion a year. Mr Key signalled that the Government would pick up at least some of the proposals, including the requirement for sole parents with no children under 3 to look for at least 20 hours of paid work each week. Under the phenomena of rallying around the leader in a time of crises, the Government have an opportunity in the wake of the quake to advance their crippling of the Welfare State with zero debate. That one of our largest social policy's might get crucified without any real public scrutiny could be the worst long term byproduct of yesterdays quake. In a tactic that National have used again and again, the ideologically stacked welfare razor gang gave the Government the radical policy they needed and managed to add an element so fascist that it made Genghis Khan wince with their 'back to work after 14 weeks' for a second child which allowed John Key to reject it creating the perception that he's moderated what is still a radical attack on society's most vulnerable and weak. National did it with the mining of conservation land, they put up Great Barrier when they never had any intention of mining Great Barrier so they could remove it from the list to make them look like they had 'listened' and create the perception of moderation. Key had the audacity to describe the forcing of mothers back after 14 weeks as making him 'queasy' which is funny because his comments that poor people who take food parcels are to blame for their own poverty alongside his claim that if he cut welfare to all beneficiaries then bugger all would starve made me pretty queasy. National's tactic of proposing 100% crazy and selling 80% crazy as compromise is like getting the National Front to write immigration policy and then look aghast at what they come up with while implementing most of it. This crippling of the Welfare State is evil. It's evil to treat the weakest and most vulnerable in Society during a recession as steep as this with such 'work sets you free' contempt, and it's time for people of conscience to call NZ on it. That's a fair enough definition of evil. What the capitalist parasites will do to keep their crisis ridden profit system afloat. Perhaps you should replace the stick in that picture with a gun. Be close to the truth.